An opening a hive in spring there are a number of important questions that the beekeeper should be able to answer. 1 Is there a laying queen present? 2 Is the brood expansion developing as expected? 3 Is there adequate food? 4 Is there sufficient space? 5 Is there any evidence of disease? 6 (Later) are there queen cells? Spring is the best time to find the queen in a colony, as the colony size is small. The queen should have started to lay and the presence of eggs indicate that the queen was present within the past 3 days. When the queen is unmarked (eg following autumn superceedure) the over-wintered queen should be marked in the spring. Some beekeepers also clip the queen’s wings at this time. The pattern of laying will determine whether the beekeeper is happy with the present queen or whether she will need to be replaced. Brood expansion is best determined by comparing the brood pattern with other colonies, acting as a benchmark. The rate of expansion can be assessed by comparing the relative proportions of eggs, larvae and sealed brood. In a steady state where the brood is neither expanding or diminishing there will be twice as much sealed brood as larvae, and twice as much larvae as eggs. If the brood is not expanding adequately this may be because of a poor queen, which will need to be replaced, or the presence of disease, which will need to be investigated. Food reserves will be used quickly when the hive becomes active, and early spring is a time of vulnerability. If the colony has poor reserves this can be managed by either adding solid sugar, fondant or candy, or by the use of liquid feed. Liquid feed will stimulate the queen to lay, and will require that the colony has a supply of pollen or the ability to collect pollen. A pollen patty could be provided. The liquid feed should be weak (1kg to 2l water) and could also incorporate Fumidil B. 4 Is there adequate space. The expanding colony will require space to develop. This is unlikely to be a problem in early spring, but as spring build-up proceeds the colony will exponentially develop. The onset of a spring flow will require additional space for processing of nectar and storage of honey, and supering may be required. Colonies can be provided with additional frames preferably with drawn comb, and the addition of brood space will be required when the brood is on 8 frames. Inspection of the colony should specifically focus on signs of disease, in both the colony and brood. 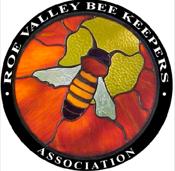 In early spring varroa levels should be checked and treatment provided with the preferred treatment. The possible signs of disease include poor colony build up, deformed bees, soiling of the frames etc. Queen cells may be present if the queen has been injured, killed or has failed. The presence of queen cells indicated a colony in trouble in spring, and unless the beekeeper has overwintered a mated queen in a nuc, the colony will not be able to provide for itself (due to the lack of drones to mate). This will require that the colony is united with one which is queen right, before drone laying develops. It is helpful to maintain a hive record containing the findings of regular inspections.